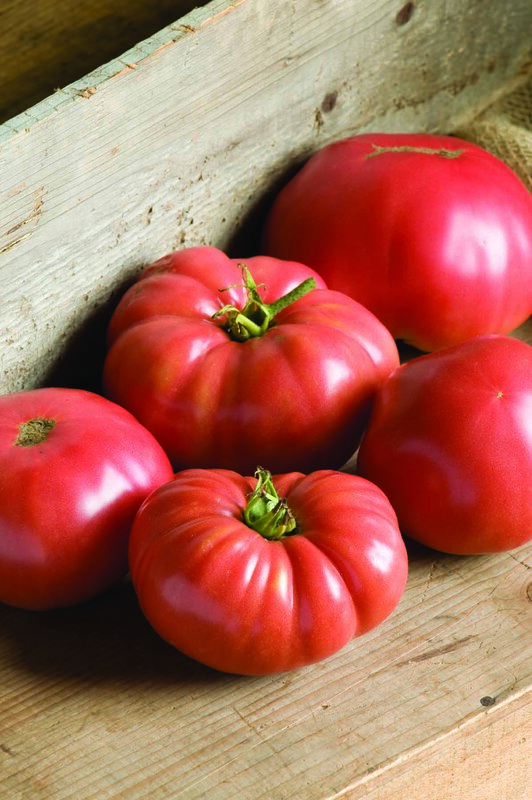 Tomatoes just like these German Johnsons can be grown year-round in an unheated greenhouse. Photo courtesy of Johnny’s Selected Seeds. As I sliced into a perfectly ripe, farm-fresh, red tomato, thoughts of a hot summer day flashed in my head. To me, there is nothing more satisfying than a juicy, salty, sweet tomato when the August sun is high in a cloudless sky. But it was late May, the temperature was a cool 45 degrees, and this wasn’t a typical tomato. It was grown during the coldest months of winter on a windswept peninsula off the coast of Maine, and it wasn’t grown using pesticides or chemical fertilizers. And guess what? It tasted absolutely divine. “I’ve always been fascinated by the word ‘impossible,’” says Eliot Coleman, the pioneer farmer behind this tomato. It’s a fascination that has lead Coleman to invent, create, and innovate tools and techniques that have taken on the “impossible” in organic farming. His innovations have been instrumental in changing the way people grow food through the coldest winter months. Indeed, without Coleman, the White House probably wouldn’t be growing greens in December. American consumers’ eating habits are changing, and the latest iteration of the US Department of Agriculture’s Farm Bill reflects that. It’s considered to be one of the most progressive farm bills to come out of Washington in decades. With significant growth in spending on local and regional food systems (from $10 million annually to $30 million), and a new emphasis on organic foods, the 2014 Farm Bill—signed by President Obama in February—goes a long way to supporting the small farmer. Many of the ideas proposed in the bill find their roots in the early organic revolution of the 1960s, which was lead, in part, by Eliot Coleman. As the son of a Manhattan stockbroker, Coleman came to farming by happenstance. After graduate school in Vermont, he found himself teaching Spanish at a college in New Hampshire, where he met his first wife, Sue. One day while shopping in a general store, Eliot came across the book, Living the Good Life, by Helen and Scott Nearing. Struck by the Nearing’s experience living “off the grid” in mid-coast Maine, Coleman was inspired to seek out a similar adventure of his own. He and Sue left New Hampshire in 1968 with $5000 in savings and bought a piece of property from the Nearings in Harborside, ME. There, with not a structure in sight, some of the least ideal soil for growing crops you could want, and nothing but a few hand tools and boundless energy, the Colemans began what would eventually become Four Season Farm, and a new organic year-round farming philosophy emerged. But Coleman wouldn’t say that there was anything innovative about the way he approached organic farming. He’d say that it was simply an extension and adaptation of farming techniques that were practiced throughout Europe and the Americas prior to the advent of industrial farming. The old ways of doing things emphasized ecosystem management to be successful: compost, crop rotation, and naturally occurring soil nutrients. But what makes Eliot Coleman innovative is that he views with disdain and skepticism many cutting-edge trends in farming, such as relying on chemical fertilizers, monocrops, and industrial-scale tools. Central to his (innovative) philosophy is that there is much more value in diversity and sustainability. Coleman began his farm by clearing the land by hand and working to make the rocky, acidic soil more balanced and fertile. It was a slow process, one acre giving way to two acres and so on—a process that continues to this day. Along the way there have been countless challenges, giving Coleman many opportunities to be creative in finding solutions. 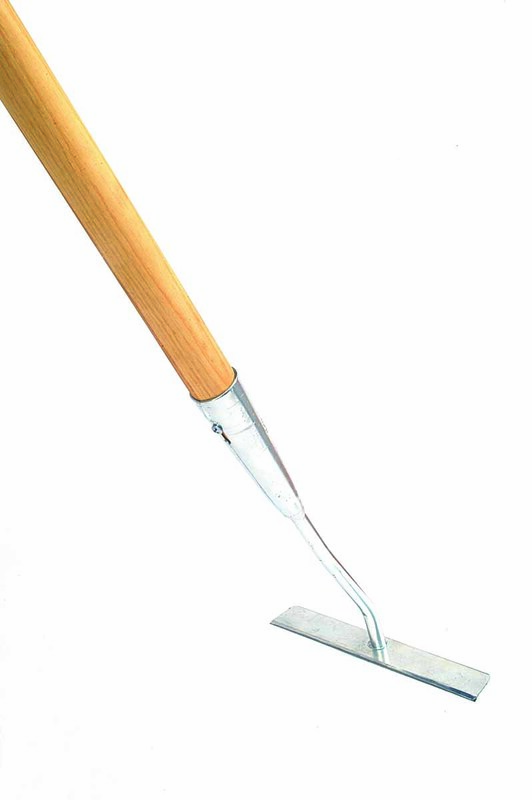 The Collinear Hoe, from Johnny’s Selected Seeds, a garden and farm supply company that Eliot Coleman works closely with to develop his ideas into production models. Photo courtesy of Johnny’s Selected Seeds. Or, how about a quick way to incorporate the right amount of compost within your soil so your compost isn’t too deep or too clumpy? Well, hook up a cordless drill to a tiller with small tines and you get Coleman’s “tilther.” What used to take 25 minutes now takes five. 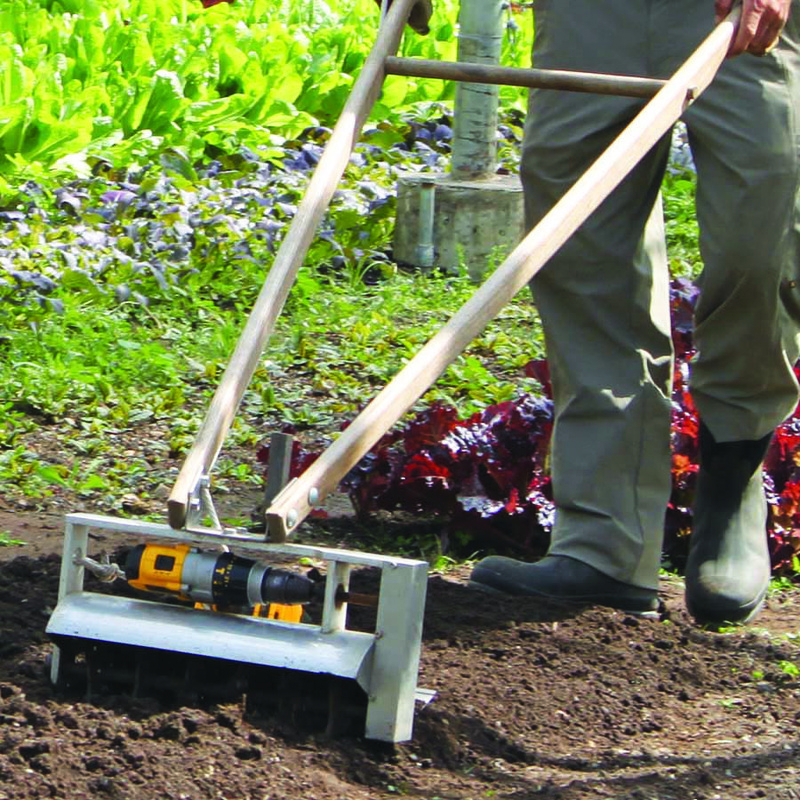 Eliot Coleman prepares a bed in the garden using his invention, the Tilther, to mix compost into the soil. Photo courtesy of Johnny’s Selected Seeds. Coleman shares Benjamin Franklin’s belief that “As we benefit from the inventions of others, we should be glad to share our own…freely and gladly.” So, he was never interested in obtaining patents for his inventions. He just wanted a tool that would make farm work a little easier. Any ideas he had, he gave to an engineer or manufacturing company so that they could perfect the tool or product. That way, Eliot and his farmer friends could all benefit from it. Perhaps his most significant contribution to commercial organic small-scale farming is the moveable hoophouse. The latest iteration is the New Cathedral Modular Tunnel, a structure that allows users to grow crops in progression with the seasons. 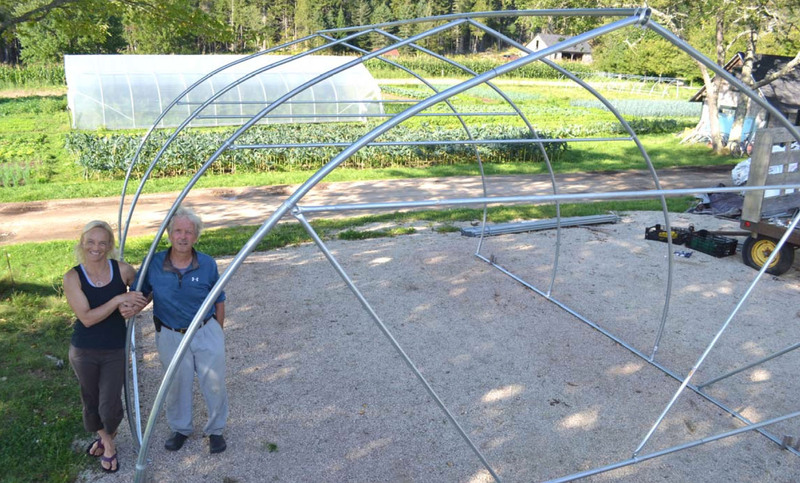 When one area of the garden needs to be covered, the tunnel or greenhouse is lifted by four people and moved, or pushed along tracks that run the length of the fields. This invention is what allows Eliot to grow juicy red tomatoes all year long. Eliot Coleman poses with his daughter Clara Coleman at Four Season Farm in Harborside, Maine. The two have just completed framing part of the 14’ Gothic Modular Moveable Tunnel, based on Mr. Coleman’s designs. September, 2013. Photo courtesy of Johnny’s Selected Seeds. The latest innovation Coleman has helped usher in is a tool called the Quick Cut Greens Harvester, which, like the tilther, uses a cordless drill as its motor. Most exciting about this invention, which makes harvesting fresh salad greens much easier than the old method of cutting by hand, was that it was invented by a 16-year-old named Jonathan Dysinger, who visited Four Season Farm and was encouraged and inspired by Coleman to pursue the idea. Watch Eliot Coleman demonstrate the harvester. Eliot Coleman’s contributions to small-scale and organic farming are numerous. From his philosophy to the methods and tools used to make it a viable business option, rejecting the conventional and daring to try the impossible are hallmarks of his work and legacy.